8Bitdo, makers of wireless gamepads based on a variety of classic controller designs including the NES and SNES, recently pushed out new firmware that expands the versatility of many of its products. Firmware version 4.0 adds compatibility for the Nintendo Switch to several of its controllers including the FC30, FC30 Pro, NES30, NES30 Pro, SFC30 and SNES30. Best yet, because the Switch already supports wireless controllers, there’s no need to use a hub or wireless receiver. Let’s not get confused here. Nintendo’s own Joy-Con and Switch Pro controllers are excellent Switch companions but like most OEM accessories, they’re expensive. Amazon, for example, will sell you a left and right Joy-Con set for $79.99 or a Switch Pro for $69. Conversely, you can pick up one of 8Bitdo’s wireless controllers for around $35 to $45. I wouldn’t explicitly recommend replacing Nintendo’s own controllers with a third-party replacement just for the hell of it but if you’re looking to add a second controller to your Switch, they’re certainly worth a look. Another benefit of owning an 8Bitdo controller is the simple fact that they’re so versatile. 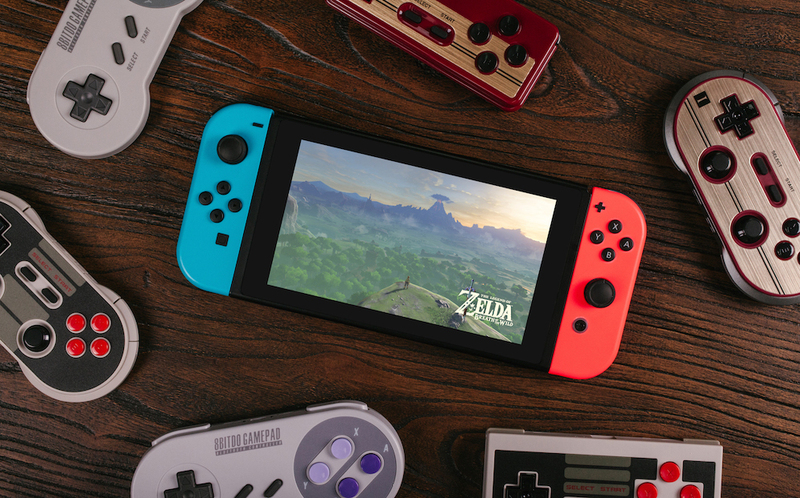 8Bitdo says all of the controllers mentioned above are compatible with Android, Windows, macOS, Steam and now, the Switch. You can grab firmware v4.0 over on 8Bitdo’s support page (instructions on how to install the firmware are included in the download).